Here’s our video for the September 2013 conference (with thanks to Nahum for camera and helping the edit). This entry was posted in Ministry and tagged FIEC on 20 September, 2013 by Chris. 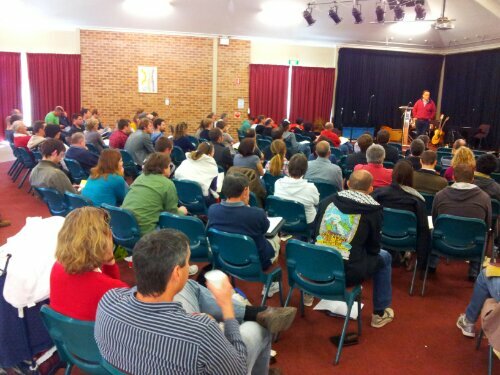 In the last few days the family and I have been at the annual conference of the Fellowship of Independent Evangelical Churches (www.fiec.org.au). Along the way, I jotted down some notes. These are not minutes or comprehensive, just some gleanings from all that we heard. There was a reminder: any and every church or Christian ministry has the basic human need as its basis. This need and problem is not sin, but the wrath of God which all sinners deservedly face. ‘But now, the righteousness of God has been revealed … in Jesus Christ whom God presented as a propitiation’ (Romans 3:21-26). How could we in FIEC ever be content with so many people unaware of and uninterested in the gospel that offers free and just forgiveness? One topic central to the conference was the nature of church. Part of thinking about church is perceiving how Christians and churches are viewed in Australia. There was a suggestion that Christians now viewed in a new way in Australia: not simply wrong, but evil. I’d not heard that before. Do you think it’s true? Within church circles, evangelical Christians are accused of having no doctrine of church (or ecclesiology). And also accused of being too congregational. It cannot be both, surely. Underlying this criticism, really, is a different view of church. To do church well, including planting new churches, we do need to be sure of what Bible says about church. We should also be aware current ways the English word brings many non-biblical meanings. We might be the ones who need to admit a need to change. For the specific doctrine of church, we benefit immensely with reminders of God’s big plan. Obviously, God’s overarching plan encompasses all other plans, including church ones. God’s plan: uniting all things under Christ (Eph 1:10). In this we certainly see individuals saved. Yet more commonly the Bible explains this as church formation. God brings peace for one new humanity (Eph 2:14-16). Jesus has everything under his get for the sake of his headship over the church (Eph 1:22). Since all true unity is gospel unity, a number of consequences follow. We need to ensure, for example, that the structure of church never trumps the gospel. We must be wary of loyalty to the FIEC, for instance. As long as FIEC exists, we should aim to be characterised by discussion of and contention for the gospel (much more than discussion of and contention for a structure!). There was more, of course. I hope these snippets give some sense of the conference. What now? Firstly: I have many ideas to share with folk at church with the aim of growing what we do in Albury. Secondly: I encourage anyone who wants to find out about the FIEC to get to the annual conference (and that includes the Albury leaders – not naming names …). This entry was posted in Christianity & culture, Ministry and tagged Church, Church planting, FIEC, Romans 3:21-26 on 3 September, 2012 by Chris.